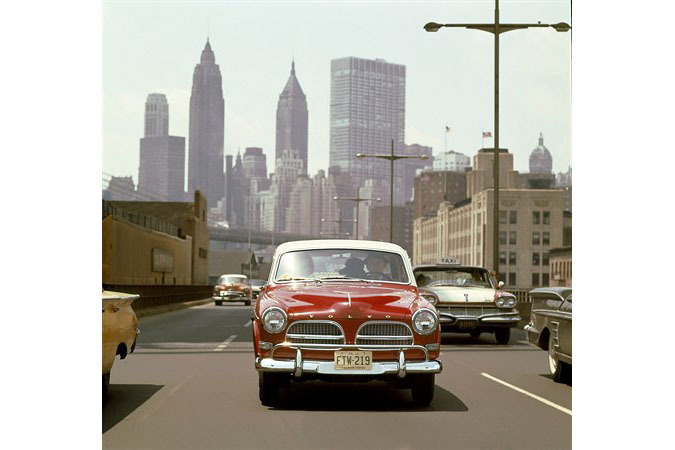 THE 1950'S - THE DECADE OF THE VOLVO 544 AND THE AMAZON - OR VOLVO P120 AS IT WAS CALLED OUTSIDE THE NORDIC COUNTRIES. 1950 - B Series of the PV444 was introduced. - 1951 - The B model of the PV444 was replaced by the C model. 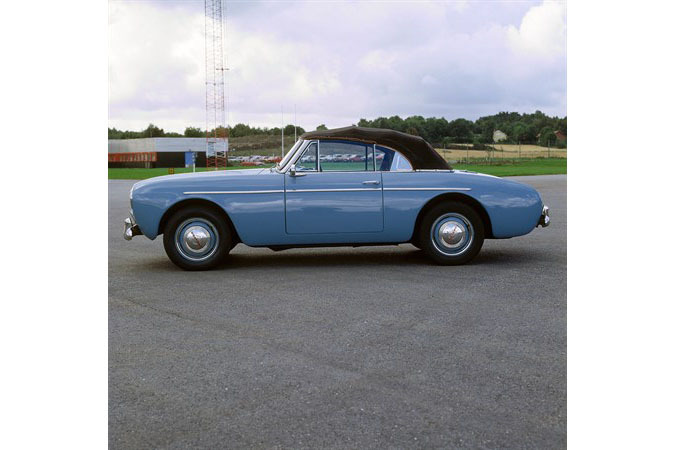 1952 - In January the 25,000th PV444 left the Volvo plant on Hisingen. 1953 - The first Volvo Duett was introduced in the summer. 1954 - the Volvo Sport were introduced - 1955 - of the Volvo Sport ceased after only one year. 1956 - The big news this year was the Volvo 120, known in Scandinavia as the Amazon. 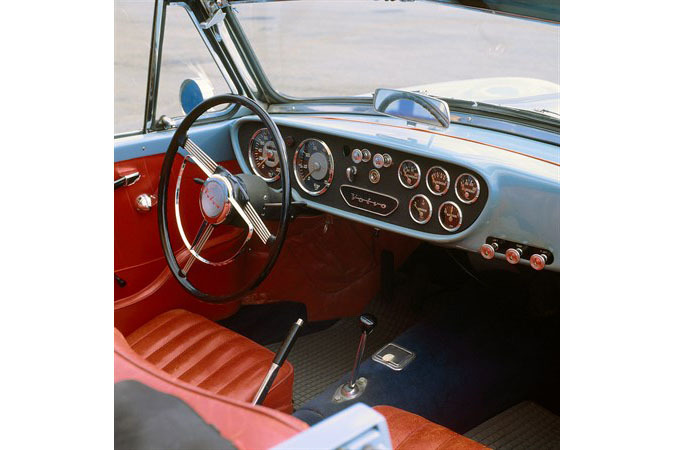 1957 - The top half of the dashboard was "padded". Safety belt anchorage points on the front seats were standard. 1958 - The windscreen on the PV544 was larger, it was not split and was slightly convex. 1959 - Volvo was the first car manufacturer in the world to equip its cars with three point safety belts as a standard fitting. 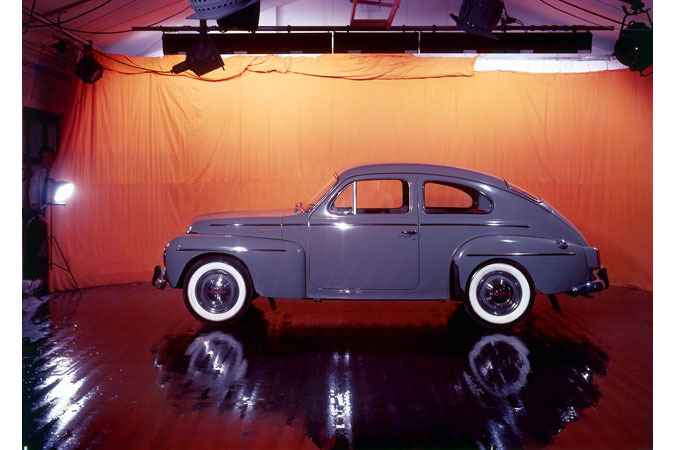 At the beginning of the 1950's Volvo concentrated on stepping up the production capacity of the PV444. In September, the B Series of the PV444 was introduced. It was available in a Standard and a Special version - the Special having virtually the same equipment as the PV444AS. Exterior features included new bumpers, and a number of modifications had also been made to the interior. The dashboard had been modernised - the somewhat difficult-to-read speedometer had been replaced by a round one. The seats had been made more comfortable, the old starter button had been removed and the engine was now started with an ignition key. One new feature which attracted a great deal of attention was the T-shaped indicator, located in the centre of the roof. When the driver wanted to turn, a blue light came on and an orange light began flashing on the side of the car. This indicator was called "Fixlight". 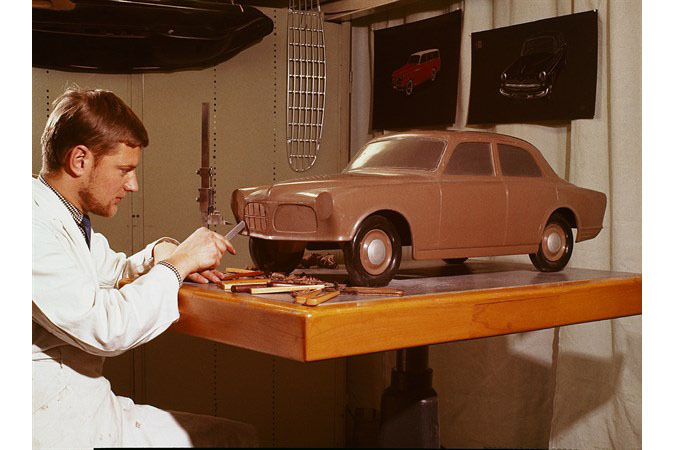 The call for a separate chassis for the PV444 by customers wishing to build their own car bodies, vans or light trucks led Volvo to design a frame consisting of a fully-welded box construction with powerful cross-stays. The wheelbase and track were the same as those of the PV444. This new chassis was known as the PV445 and was supplied to Brazil, Uruguay and Peru, in addition to Sweden. New taxis in the 800 Series, the PV831/832, were presented in the autumn. They had an "Americanised" front and had five upright "teeth" between the front bars. The PV833 and 834 chassis were still included in the range and were used as a basis for ambulances, vans and light trucks. The B model of the PV444 was replaced by the C model, although the changes were minimal. In order to make full use of the 1,500 PV445 chassis Volvo has built, a decision was made to design an estate car body. The lines of an estate which later became famous as the Volvo Duett took shape at the body plant in Olofstrom. 1951 was a successful year, with a total turnover of 310 million Swedish kronor. In Skovde, where the engines were made, the foundry had been extended and new assembly lines were soon to be completed in Gothenburg. In January the 25,000th PV444 left the Volvo plant on Hisingen. The PV444D and DS were equipped with a more powerful alternator, modified steering and a specially-designed heater as an optional extra. The much discussed "Fix light" disappeared and was replaced by side indicators. Gustaf Larson left his position as Deputy Managing Director and Technical Director to go into retirement. He still acted as a consultant to Volvo and exerted a great deal of influence for several more years. The PV444 was available in maroon with red and beige upholstery from the beginning of the year . The price was 10,860 kronor for the Standard model and 11,415 for the Special (with stainless steel rims, double sun visors, a cigarette lighter, grab handles and stainless steel decor mouldings on the wings). The PV444E/ES was presented in April. The ES was available in pearl grey - a lighter version of the standard grey which, together with black, had been the standard 444 colours. The price was reduced - and Volvo's car production almost doubled this year. The PV444 was the best-selling car in Sweden in 1953. The first Volvo Duett was introduced in the summer. 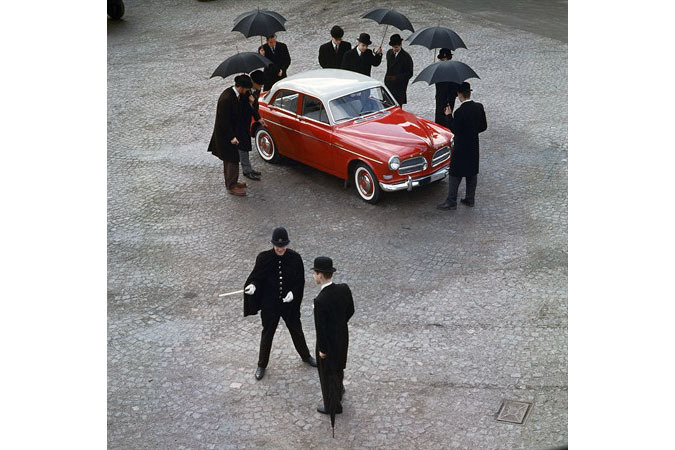 The name Duett symbolised Volvo's idea of "two cars in one" one for work and one for leisure. During the year a luxury version of the PV831, the Disponent (President), was presented. It was designed as an official vehicle and had a luxurious interior with grey upholstery, light-grey material and a grey velour carpet on the floor. The standard equipment included a radio and loudspeakers, a clock and two extra cigarette lighters for rear seat passengers. This car was available in livery blue or maroon. Volvo's plans for a two-seater sports car came as a great surprise. After all, the Volvo was known as a good, sturdy car, albeit a little boring. Even so, three prototypes made of fibreglass-reinforced plastic with puncture-proof tyres were presented in June. The car was called the Volvo Sport and was primarily intended for export. The prototypes were shown on a PR tour of Sweden, and the tyres were demonstrated by driving over a spiked mat. The audience was swept off its feet. In November Volvo presented yet another new feature which took all motoring Sweden by surprise. The five-year motor vehicle damage warranty was introduced. In this warranty Volvo undertook to pay all repair costs exceeding 200 kronor resulting from accident or damage for a period of five years. This warranty was included in the price of the car and, as Volvo had reduced its prices in 1953, the offer was clearly advantageous. The Swedish Private Insurance Inspectorate felt that this warranty contravened the insurance laws and took the matter to court. This was the start of a four-year battle from which Volvo eventually emerged as the winner. In December the PV444H/HS was presented and the changes were more extensive than for many years. The windscreen was larger, the windscreen pillars were narrower, the rear screen was wider and the spare wheel now stood in the luggage compartment instead of lying on the floor as it had done previously. An export model was also developed. It was slightly less well equipped to enable it to compete in terms of price on certain markets. 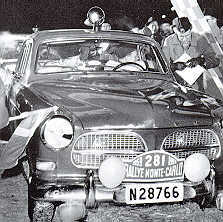 The Volvo Sport, which was now known as the P1900, was subjected to gruelling tests in Sweden. The engine was a B14A with twin carburettors which developed 70 hp, but the other components had been taken from the PV444. 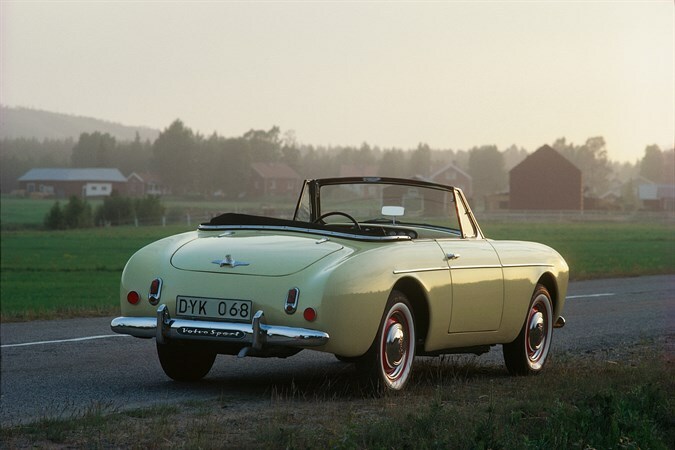 There was little demand for the P1900 in Sweden, however; only 67 cars were produced and production ceased within one year. Volvo made its entry onto the US market - the land of the motor car - with the PV444 "Like selling refrigerators to Eskimos," many people said. In Save outside Gothenburg Volvo rented a large area of forest covering 35,000 sq.m where a permanent proving ground was built. The big news this year was the Volvo 120, known in Scandinavia as the Amazon. This model was the result of an in-depth pilot study in which a number of different versions had been examined. 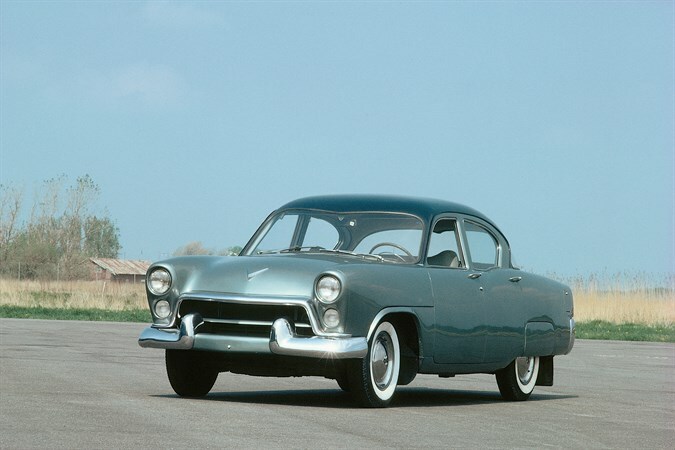 It was introduced as a four-door model and was given its characteristic appearance by a split grille, curved pontoon wings and large wheels. The body was completely unitised in a fully-welded construction which had been given thorough anti-rust treatment. The instrumentation was new and different. The engine had been newly developed and was known as the B16A. Output was 60 hp. For the first time, Volvo supplied cars in two-tone colour combinations. The price was 12,600 Swedish kronor. The car was known as the Amazon only in Scandinavia, since a motor cycle manufacturer had patented the name on the Continent. So, outside Scandinavia the Amazon was called the 121, or the 122S in the sports version. The 100,000th PV444 was produced in January. Later that spring the 444 was exhibited at the New York Motor Show. By the summer Volvo had more than one hundred US dealers and the market gave the special white Swedish car with the light yellow/black upholstery and black steering wheel a good reception. A third version of the Volvo Duett, the 445H passenger estate, was introduced. Assar Gabrielsson retired and was succeeded by the head of Volvo Flygmotor, Gunnar Engellau. The Volvo management decided to make a wholehearted commitment to internationalisation; the introduction on the US market was incredibly important. Production of the Amazon began in 1957. A great deal of work had been put into its safety features. The top half of the dashboard was "padded". Safety belt anchorage points on the front seats were standard. The PV444 was given the same engine as the Amazon, the B16, and the grille now had a more tightly-meshed pattern with a golden 'V' emblem. Between 1950 and 1957 Volvo produced more than 4,000 taxis and the Swedish taxi ranks were totally dominated by these large black Volvo cars. The company had 13,000 employees. 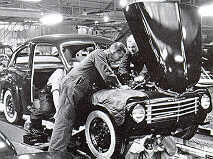 More than 50,000 cars were produced. In August Volvo presented a real surprise - the PV544, a development of the PV444 in a more modern design. Many people had thought that the PV444 would disappear following the introduction of the Amazon, but despite its somewhat out-dated appearance the car was still modern under the bodywork and offered good performance and driving characteristics. The windscreen on the 544 was larger, it was not split and was slightly convex. The rear screen was also much larger. The tail-lights were bigger and the dashboard had the same horizontal type of speedometer as the Amazon. The 544 was available in four models with different engines and equipment. Volvo's turnover exceeded 1,000 million kronor for the first time and the 100,000 export mark was passed. The Amazon and the PV544 were equipped with three point safety belts, which meant that Volvo was the first car manufacturer in the world to equip its cars with safety belts as a standard fitting. The Volvo 122S and the PV544 were introduced in the US in April. In November, preparations began for a new car plant in Torslanda outside Gothenburg. Volvo purchased a 4,000,000 sq.m site and the building of access roads began. During the year 39,016 Volvo cars were registered in Sweden, the highest figure a car make had ever achieved.